PBIS is a framework or approach for assisting school personnel in adopting and organizing evidence-based behavioral interventions into an integrated continuum that enhances academic and social behavior outcomes for all students. PBIS IS NOT a packaged curriculum, scripted intervention, or manualized strategy. PBIS is a process for creating safer and more effective schools. It is a systems approach to enhancing the capacity of schools to educate all children by developing research-based, school-wide, and classroom behavior support systems. The process focuses on improving a school’s ability to teach and support positive behavior for all students. Rather than a prescribed program, PBIS provides systems for schools to design, implement, and evaluate effective school-wide, classroom, non-classroom, and student specific plans. PBIS includes school-wide procedures and processes intended for all students and all staff in all settings. PBIS is not a program or a curriculum. It is a team-based process for systemic problem solving, planning, and evaluation. It is an approach to creating a safe and productive learning environment where teachers can teach and all students can learn. Positive Behavior Intervention Supports (PBIS) is a system for teaching and supporting positive behaviors and meeting the needs of ALL students. This school-wide approach to discipline focuses on building a safe and positive environment in which all students can learn. 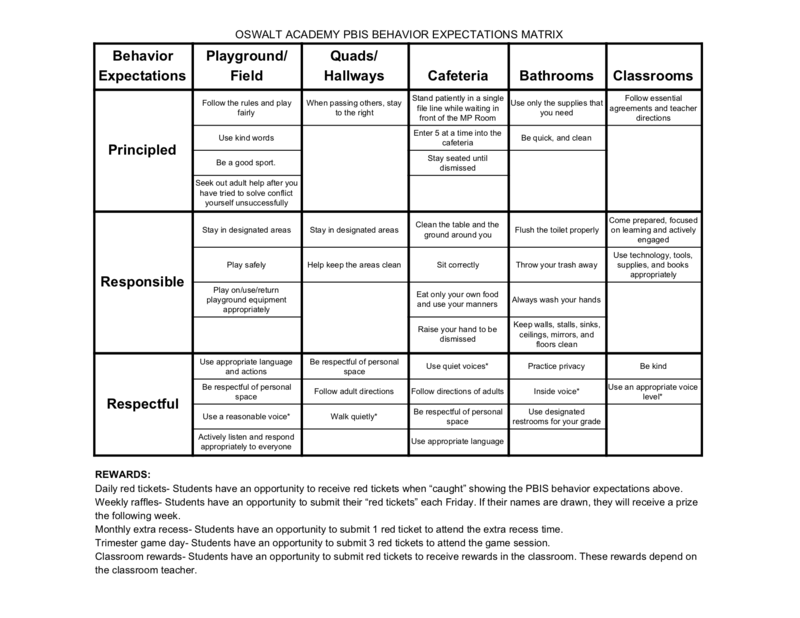 In addition to our behavior expectations, PBIS has four other components: 1) a behavior matrix which explains behavior expectations in each school setting; 2) direct teaching of the expectations; 3) PBIS recognition cards; and 4) behavior tracking sheets to record and address inappropriate behaviors. WHAT IS PBIS AT OSWALT? ⇒ Constantly teach and refer to our school-wide expectations. ⇒ Provide students with more praise than correction. ⇒ Talk to students with respect using positive voice tone. ⇒ Actively engage everyone in the class during instruction. ⇒ Use pre-correcting, prompting, and redirecting as we teach. ⇒ Look for the positive first and provide positive, immediate, frequent, and explicit feedback. Throughout the school year, students will be taught how to behave according to the five school-wide expectations. Teachers will help students learn what the expectations “look” and “sound” like in every setting during the school day. These lessons will be re-taught and reinforced throughout the school year and become a regular part of our instructional program. • Red Tickets are earned when a student shows Principled, Respectful, Responsible characteristics. A student can earn tickets at any time of the day and from any staff. • Weekly drawing where students can earn a prize and recognition during morning announcements. Acknowledging and reinforcing positive behavior is one of the best ways to change inappropriate behavior and encourage appropriate behavior. At Oswalt, each student will earn recognition through Red Tickets for meeting behavior expectations. When goals are met, students will enjoy participating in periodic school-wide celebrations. The behavior matrix is a detailed description of expected behavior in each setting of the school. For example, in the dining hall it is respectful to say “please” and “thank you.” It is responsible to clean your space. The matrix will be posted in classrooms, around school and sent home. Even with clear expectations and positive reinforcement, sometimes children will make poor choices. A Behavior Tracking Sheet will be used to address inappropriate behavior and help staff assess what additional supports the student might need. Discipline issues are divided into major and minor infractions. A minor/ major description chart is available. Major infractions are issues that result in office time. Parents will always be notified by the Principal or teacher about major infractions. Minor infractions are behaviors that are disruptive to the learning environment, but are handled by the supervising staff member. If a child receives three minor infractions in one week, it becomes a major infraction and the Principal will address the behaviors and parents/guardians will be notified. When a child repeatedly receives minors or major referrals, parents/ guardians, teachers, support staff and the Principal will meet to build an effective behavior intervention plan for that child.